In our capacity of permanent observers of the WIPO Standing Committee on Copyright and Related Rights (SCCR), we are attending the 38th session of the Committee, which is taking place in Geneva from 1 to 5 April 2019. I’m speaking on behalf of COMMUNIA, an international association that works to protect and strengthen the public domain and users’ rights. We believe that there is a minimum set of access and use rights that should be defined by public rules, since they are justified by public interests. If copyright laws do not grant to the education and research communities, the cultural heritage institutions, and the persons with disabilities the same level of protection that is granted to rightsholders, and defer to private agreements the regulation of all uses of copyrighted materials, they perpetuate an unbalanced power structure and let rightsholders weaken or undermine what should be a public policy decision. Private agreements are important in any market, but they should coexist with – and not replace – exceptions. Agreements are not appropriate to harmonize the legal framework for uses of copyrighted works, because the terms and conditions of licenses vary widely, and they are not available for every material in every country. There are countless copyrighted works in existence and the large majority of creators is not interested in licensing their works (only a small class of professional creators is offering their works for licensing). Thus, it is impossible to offer meaningful solutions to users through private agreements only. In order to have a minimum set of rules that are applied uniformly by every Member State and have a cross-border effect we need an international law. The ongoing reform in the European Union should be enough for this forum to understand that agreeing on minimum standards is possible, while still taking into account local specificities. We are ready for another year, fighting the good fight! In the age of connectivity, it is not enough to fight for better copyright laws for users in certain regions of the world. We need to advocate for baseline international standards that allow cross-border uses of copyrighted materials, for purposes such as access to knowledge and education, in each and every country of the world. 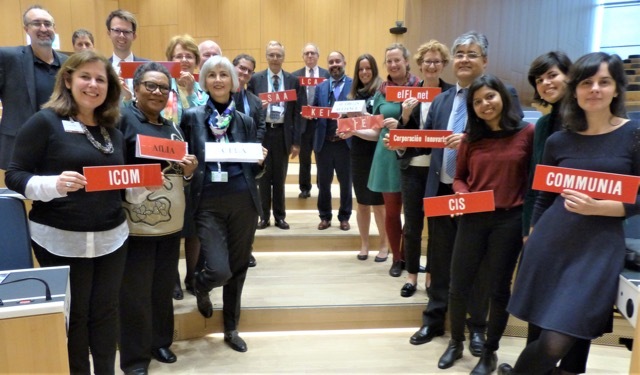 That is why public interest advocates, Communia included, keep investing their energies in the international discussions on copyright exceptions, using their capacities of permanent observers of the WIPO’s Standing Committee on Copyright and Related Rights (SCCR). The SCCR has a mandate to discuss, among other things, limitations and exceptions to copyright for libraries, museums, archives, persons with disabilities, and for educational and research activities. In June 2018, the Committee adopted Action Plans on Limitations and Exceptions, which include a series of events dedicated to analyze the situation of libraries, archives, museums, education and research, and to identify “areas for action with respect to the limitations and exceptions regime”. If planned correctly, with the main purpose to assess the needs of the potential beneficiaries of the exceptions, these events could advance the international agenda on copyright exceptions. In our capacity of permanent observers of the WIPO Standing Committee on Copyright and Related Rights, we are attending the 37th session of the Committee, which is taking place in Geneva from 26 to 30 November 2018. Communia has endorsed the Civil Society Proposed Treaty on Copyright Exceptions and Limitations on Education and Research Activities (TERA), and asks others to follow suit, ahead of the 37th session of WIPO’s Standing Committee on Copyright and Related Rights (SCCR). SCCR/37 will take place from 26 – 30 November in Geneva, and civil society advocates will propose that the treaty’s provisions be considered as a model for future text-based work by the committee. The proposed treaty is the result of an extensive consultation process with various stakeholders (including Communia), which culminated with its adoption at the 5th Global Congress on Intellectual Property and the Public Interest on September 27, 2018. Institutions and individuals are both welcome to endorse the treaty. In our capacity of permanent observers of the WIPO Standing Committee on Copyright and Related Rights, we have been attending the 36th session of the Committee, which is taking place in Geneva from 28 May to 1 June 2018. I’m speaking on behalf of COMMUNIA International Association on the Digital Public Domain. We would like to start by thanking all the delegates for demonstrating their support for education throughout this SCCR. We would also like to thank the Chair for preparing the Draft Action Plan, and we have 2 suggestions to make regarding the planned actions. The first is on the typology. We welcome the Chair’s proposal to synthesize, organise and classify the information contained in the study performed by Prof. Seng, and we would be pleased to offer our advice to the Chair in the development of the proposed typology. At COMMUNIA we have been mapping educational exceptions for several years now, and we have created a template that breaks down the different provisions into their essential elements (users, uses, purposes, works, conditions and preclusions) and shows simple yes/no or 0/1 results, which permit a quick understanding of their differences and similarities. This template was recently updated, in collaboration with PIJIP, to reflect the different provisions analysed by Prof. Seng and could, therefore, be a good reference to the Chair. The second suggestion regards the study on digital issues. We believe that such a study is only useful if it brings evidence regarding the gags, legal uncertainties and obstacles that may inhibit the development of digital education and research. Cross-border related problems encountered by these stakeholders. In our capacity of permanent observers of the WIPO Standing Committee on Copyright and Related Rights, we are attending the 36th session of the Committee, which is taking place in Geneva from 28 May to 1 June 2018. The normative work of this Committee towards the grant of exclusive rights over copyrighted works and related subject matter has been exemplary. One would expect that users rights would have by now been subject to similar legislative efforts. However, the Member States that already benefit from sophisticated copyright exceptions and limitations, have been reluctant to make a convergence of laws, suggesting that the protection of public interests such as access to knowledge and education deserve less international attention that the protection of the private interests of copyright holders. We recall that the European Union will soon adopt a mandatory exception for various uses, which will harmonize the laws of 28 European countries, despite their different traditions. This means that agreeing on minimum standards is possible, while still taking into account local specificities. The reason why the EU is harmonizing national laws is very straightforward: the EU countries have such narrower exceptions that they are making illegal legitimate practices that take place on a daily basis, such as showing a Youtube video in class or emailing short copyrighted materials to students. We are well aware that the industry claims that the needs of the global community of educators, learners and researchers can be solved through licensing. If that was the case, we would not be here, since there are currently no laws preventing parties from entering into licensing agreements. The fact is that licenses are, first of all, expensive: 1/3 of European teachers surveyed by the European Commission said that they or their schools could not afford to buy educational licenses. Furthermore, we did a study on educational licenses in Europe and discovered that the current contractual practices are not commendable: licenses (i) restrict the scope of protection of exceptions, (ii) grant questionable rights to right holders, and (iii) impose burdensome obligations on schools.Without legislative intervention, fair educational and research activities that take place locally but also across borders will continue to be harmed. Therefore, we urge this Committee to agree on action plans that are aimed at finding a model for a minimum harmonization in the field of exceptions and limitations to copyright. The following is the statement made by Teresa Nobre on our behalf on agenda item 5: Protection of Broadcasting Organizations. We would like to urge this Committee to consider the interests of all relevant stakeholders, when working on agenda item 5. The discussions on the protection of broadcasting organization have been revolving mainly around the private interests of such organizations and other beneficiaries of copyright. We consider that the Committee should also engage in discussions aimed at ensuring the protection of the interests of users, namely the global community of educators, learners, researchers and librarians, and also the general Internet users that create user generated content. Taking these public interests into account includes developing mandatory exceptions and limitations that protect legitimate practices, such as criticism, parody, uses for the purposes of teaching or scientific research, and uses by libraries and other culture heritage institutions. It also requires making clear that the exceptions for broadcasting rights are not less enabling for users than the exceptions that apply to copyright. Furthermore, protecting users rights implies that the broadcasters are not given rights in works that are in the public domain, or that are openly licensed. Finally, any treaty granting post fixation rights should foresee that the term of protection of those rights does not in any case extend beyond the term of copyright, in order to give legal certainty to users and to avoid deepening the already complex issue of accessing and using orphan works. We look forward to participating in further debates on these issues. Contrary to what the negotiating parties expected (and what many civil societies organizations feared), the Mercosur-EU Free Trade Agreement (FTA) was not signed during the World Trade Organization (WTO) Ministerial Conference that took place at the beginning of December in Buenos Aires. Thus, the signing of the FTA that has been negotiated for almost twenty years was postponed once again. Over this time the negotiations were frozen during the era of the leftist governments in South America, but regained speed after the arrival of neoliberal governments to Brazil and Argentina. Like many other multilateral agreements that have been negotiated in recent years (TPP, TTIP, etc. ), the Mercosur-EU FTA covers a large number of areas (not all strictly related to trade) ranging from the exchange of goods to capital movements, phytosanitary measures, electronic commerce and intellectual property (IP). The area of ​​negotiation related to IP is extremely broad, including patents, trademarks, geographical indications and copyright, among other topics.